The Firminator is by far the most versatile piece of equipment in the industry. The operator can choose from a wide range of angle and pitch adjustments to perform many different functions. If a site is to be planted for the first time and is heavy with debris, the disk angles can be set aggressively along with a heavy forward tilt of the entire unit for deeper disk penetration. 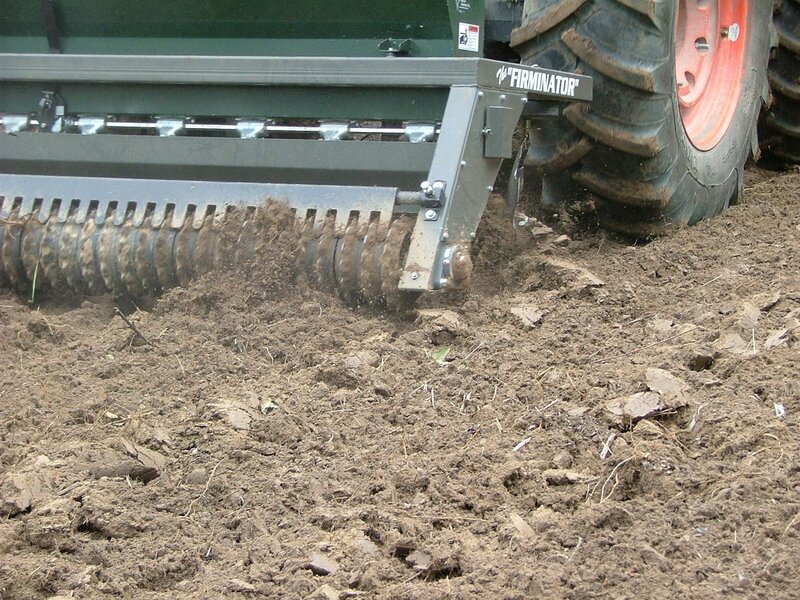 If a minimal till operation is desired, then the angles and pitch can be adjusted to just slightly cut through top litter without disturbing the soil excessively. 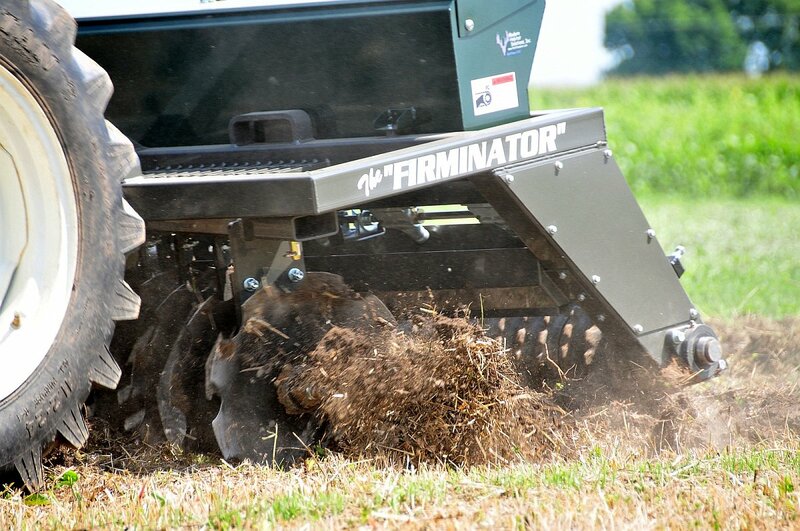 A common question we get is: "Do I need to disk the soil with other equipment first before using The Firminator?" The answer is NO! 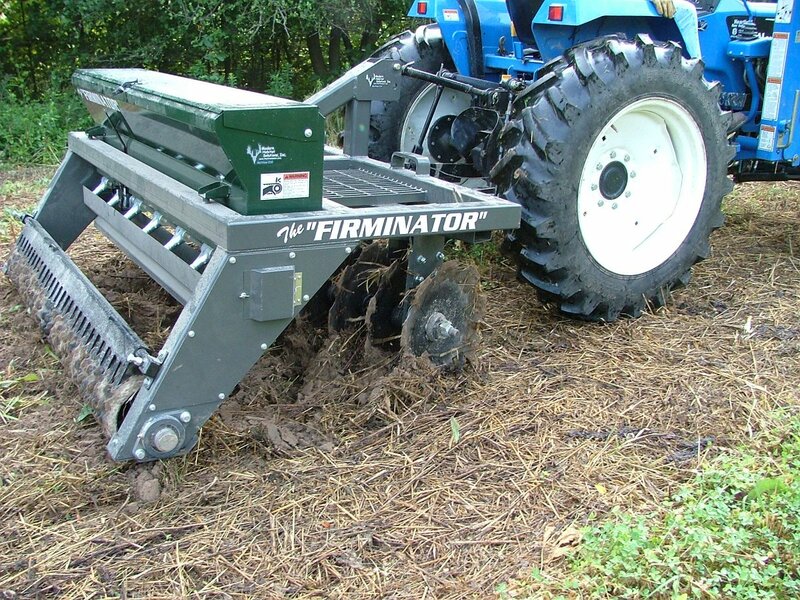 The Firminator will do all the necessary work of planting a food plot from start to finish. The disk angles are adjusted easily by the removal of a pin and sliding the pivoting disk beam to one of many holes on an arc: Choose from straight, 5, 10, 15, and 20 degree angle settings. You may set the aggressiveness of the disk angles suitable to loosen your particular soil type and situation. We recommend using the straight or a minimal angle for lightly opening thatch and soil to perform over seeding without disturbing existing forages. It is this method also that allows for "no-till" type seeding. 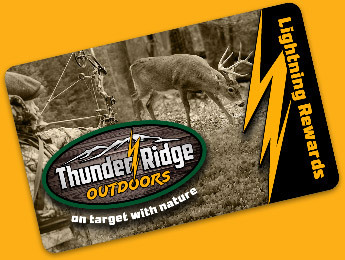 The disk blades of the Firminator food plot implement are heavy, 18", notched 9-gauge steel. One very beneficial feature is that our disk blades are spaced at 6 spacing with custom made iron disk spools. Competitors disks are spaced at the standard 7-1/2" distance. This translates into more disk blades across the width of The Firminator (12 on the six foot unit) which results in a more thorough cut into the soil which in turn means fewer passes to get great results! 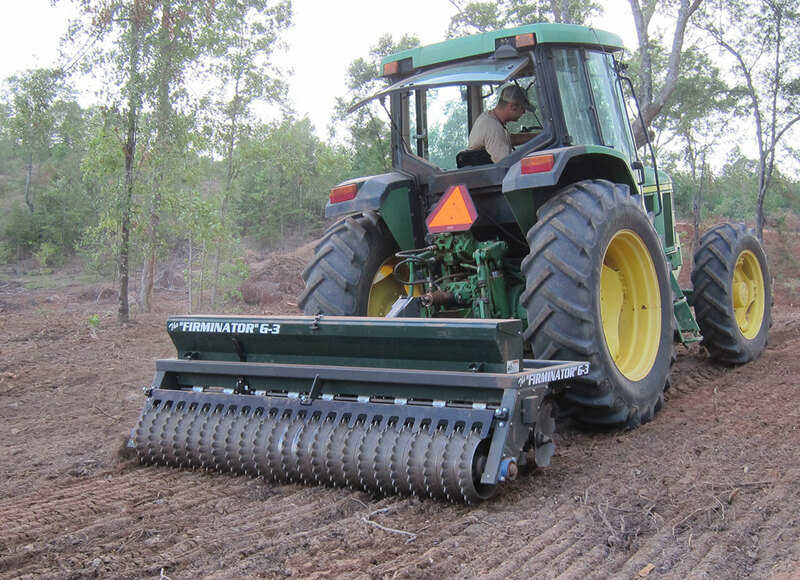 The Firminator comes standard with disk blade scrapers to prevent mud and vegetation build-up, and an adjustable center-ripper shank to cut the margin of soil between the two center blades. This shank is depth adjustable, and removes with two pins. 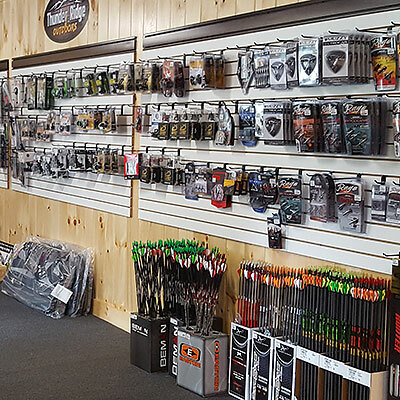 The disk axles are carried in triple-sealed replaceable bearings, and feature cast-iron spools for weight and durability. Each Firminator comes standard with 9" diameter cultipacker wheels, and are now available with a 16" diameter upgrade. The new 16" cultipacker upgrade will be very beneficial for use on sandy or extremely loose soils. The larger diameter will prevent soil from flowing up and over the wheels. The larger wheels will effectively overtake and cultipack the sandiest and flour-like silty soils. 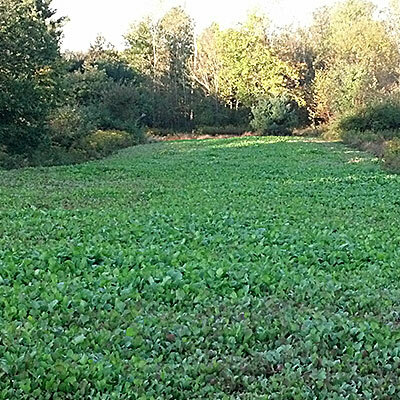 The cultipacker is a very important component for proper food plot installation. The heavy, notched, cast-iron cultipacker wheels are proven to eliminate air space, pulverize clods and level the soil while providing a beautifully prepared, firm seed bed. This is essential for achieving high germination rates. Small seeds should be applied on top of a cultipacked seed bed while larger seeds can be cultipacked into loose soil to cover them and provide great soil contact. 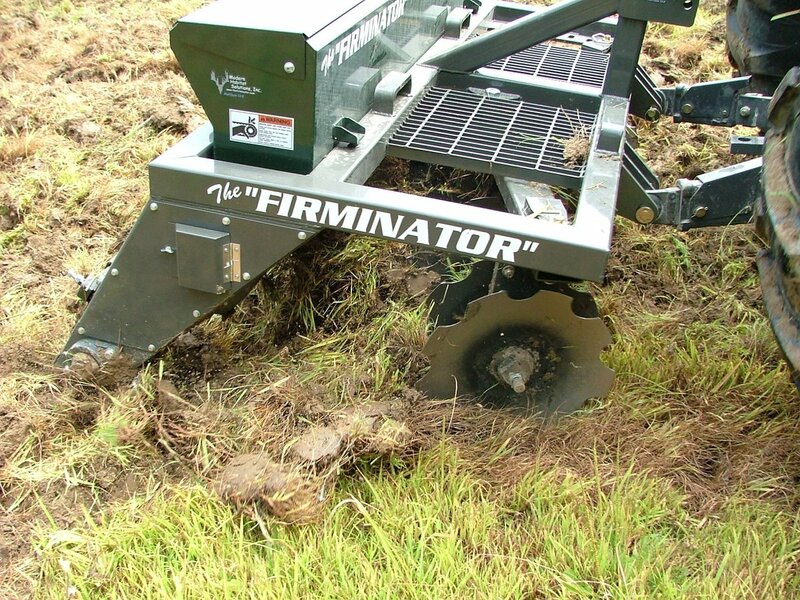 The Firminator got its name from the resulting seed bed that it produces! Each unit is also equipped with a series of cultipacker scrapers to keep the assembly clean and rolling in even less than ideal conditions. The Accu-Seed System is another incredible feature of The Firminator. It handles seeds of all sizes from the tiniest of clovers up to corn, soybeans, peas, sunflowers and everything in between! 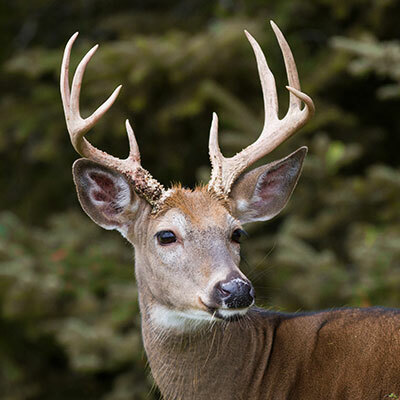 It is this versatility that makes it an excellent choice for todays land managers and can be used to properly install food plots, filter strips, pastures, lawns, and other conservation plantings. Because the system is ground driven, the seed is metered out relative to the speed you are traveling. When the Firminator stops rolling, the seed stops falling. No more wasted, expensive seed! 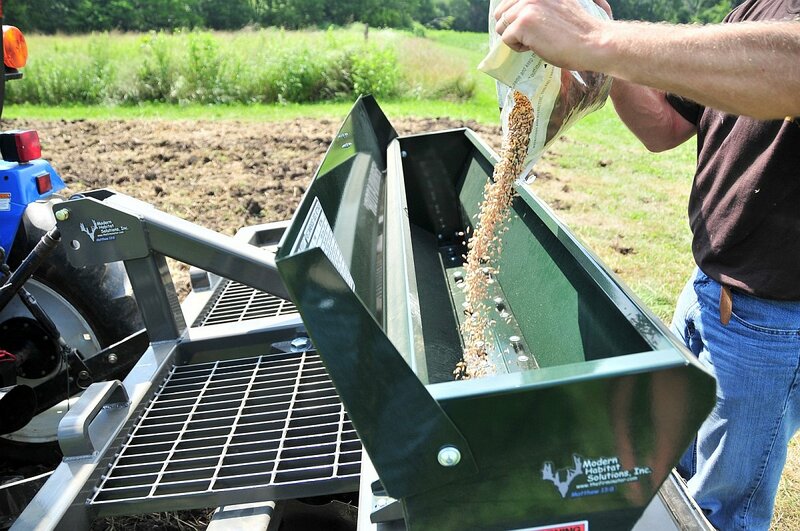 You may fill the seed hopper and adjust the metering openings by moving the linkage handle on the back of the seed box. An indicator on the handle shows the seed size selections in one-sixteenth inch graduations. Simply set the size for the largest seed in the hopper, and the metering system will dispense the seed at the generally accepted rate. It almost sounds too simple! When you are ready to dispense the seed, open the small access door on the side of the frame, pull and turn the small pin one-quarter turn and release! This engages the metering shaft and seed will now be allowed to fall as the Firminator begins to roll. The seed is dropped into a specially designed seed baffle that thoroughly distributes the seed right in front of the culti-packer and also protects the seed from wind deflection. You know exactly how wide your seeding pattern is, once again eliminating guessing and waste. An optional seed hopper agitator is available. This agitator is useful for keeping seed thoroughly mixed and preventing small seeds from sifting through too quickly when custom mixing seeds of extreme size differences. Most commercially prepared seed blends DO NOT necessitate the agitator option. Other quality features of Firminator are: Greasable flange bearings, 3" square tubing frame, heavy plate steel flanges, durable, attractive powder-coat finish, stainless steel metering shafts, bronze bushings for lubrication and durability, adjustable chain tensioners, and simplicity of use.